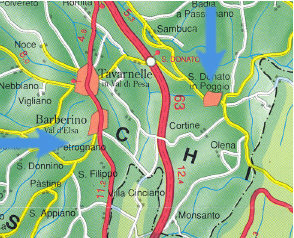 To help you to find the very best of the Chianti kitchen and to avoid bad surprises I have collected the restaurants, pizzerie, and other resources I personally, or trusted persons, have tested. At the moment they are few, but I think it is better few tested good resouces than many untested or not excellent resources. Hope for the future to be able to find and add add more and receive your feedback on this subject in order to improve and help others to find only the best. Your comments are very welcomed so write me ! I will test and rate your suggested food resouce ! The best place to have a very good lunch in Florence, and do not loose too much time while visiting the town center and pay little is the bakery "IL FORNO". There you will find sandwich, pizza, filled waffle. It is a very good solution for a fast lunch while in the center of Florence because it is just between the Duomo and Palazzo Vecchio, in a narrow road parallel at via Calzaioli road "via Santa Elisabetta". When I'm in the Florence center I always go there, every other pizzeria or fast food resource is more expensive and has not the quality of that bakery. My personal rating for their sandwich is a FIVE STAR. The best place to have dinner was once the restaurant pizzeria "Le Scuderie" it has changed management and is now called "Pizzeria Munaciello" I have not yet been there. I do not have a classification but since it is a huge place where you can easily find space let me persuade to still mention it. The sushi restaurant Momoyama located in Borgo San Frediano 10/R is a sushi restaurant (Sushi, Sashimi, Tenpura...) as excellent as expensive in a historic palace Tel: 055/291840. If you like sushi that is for sure the best place in Florence to eat it. FIVE STAR. The best place to have lunch or a snack in the afternoon while visiting the middle aged villages of Radda in Chianti, Castellina in Chianti and Gaiole in Chianti and the castle of Meleto is in the village of Volpaia. At the right of the tower house in this picture you have the wine-bar where you can find the best ham, salami and cheese and of course wine, on the left you have the "La Bottega" restaurant. Both are excellently managed by the family Barucci themself who will host you in a very friendly way. FOUR STAR. 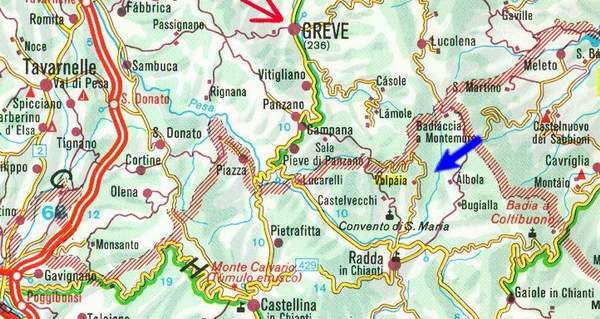 On the map you have the Blue arrow pointing at the village. The ideal place to eat after the visit of the Brolio Castle. 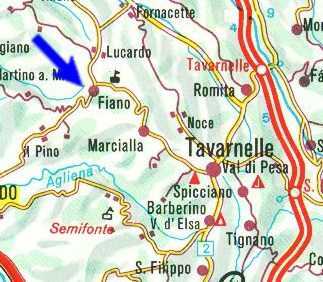 In fact it is better to avoid the restaurant at the bottom of the castle being very expensive in favour of the Trattoria in the San Regolo village. The "IL CARLINO D'ORO" is a little Trattoria quite not visible from the road but next to the main Church of the village (you can park the car there). It has the tipical roasted meat of the countryside, the meat cooked is goowed up in the countryside so it is better than the meat you can find in supermarkets. Very good first plates and dessert also. FIVE STAR. Once it was the best pizza, it remains the best view at the "L' Archibugio" spaghetteria-pizzeria. It is located in the historic center of the Medieval village of Barberino Val d'Elsa and you eat on a panoramic terrace with a faboulous panorama on the sunrise direction Due of the mix of the wonderful panorama and the reasonable price you have to book in advance to eat there at a reasonable time. The "antipasti" are no more faboulous as they were once upon a time, the first plates are normal, the pizza remain the best of the house even if it is not the better you can find in the surroundings.The rating for their pizza is 3 STAR. 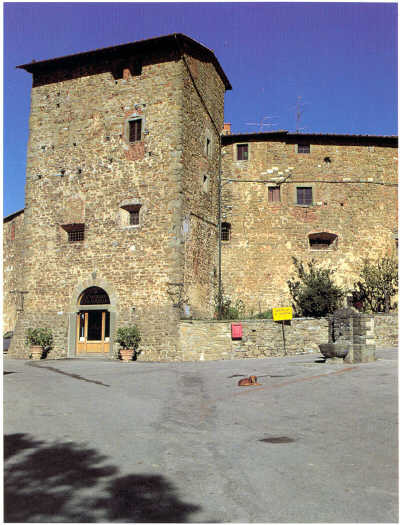 Always in the historic center of the village, the same view of the Archibugio is the "Campanellino", on the right side of the Church (looking at it) it has rabbit and tipical tuscany products. More expensive but a different kind of taste. Rating FOUR STAR. RISTORANTE IL PAESE DEI CAMPANELLI is very nice but so expensive that I have not tested it. The modern village of Tavarnelle Val di Pesa can offer you the best of the tradition and the best of the new revisited old tradition. The Ristorante Osteria "La Gramola" (via delle Fonti n° 1- tel. 055 80 50 321) has the typical traditional plates of the countryside. Don't miss the "Pappardelle alla Nana". They are confirmed for the gorgeous plates and for their "Peposo" a spicy mix of meat coocked in the owen for several hours, and theys umbateable speciality especially good when accompained with red chianti classico wine. FIVE STAR. 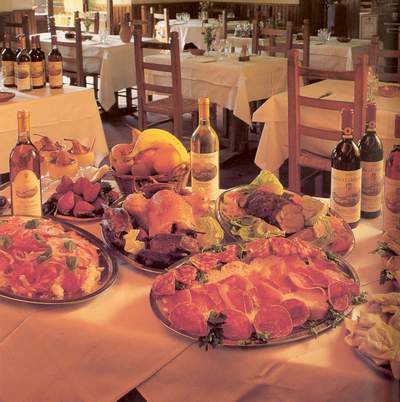 The revisited old tradition is positively experienced in the Ristorante "LA VECCHIA PIAZZA" (Piazza Vecchia n° 58- tel. 055 80 76 600) they have gorgeous entree (fourmages with marmalades and honey) salumi and faboulous crostini. The owner was once the owner of the Archibugio so the best Pizza is here. Lately they are making plates more little in quantity but hopefully not in quality. FIVE STAR. 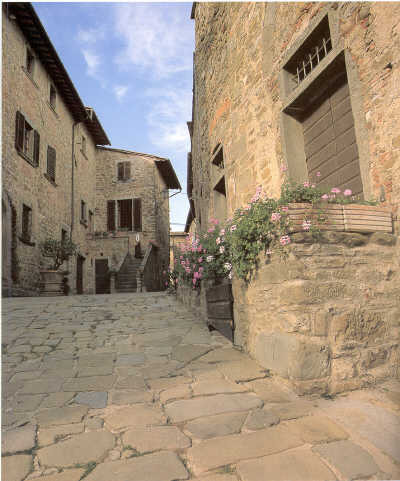 The trattoria "La Toppa" is in the historic center of the Medieval fortified village of San Donato in Poggio, in the Tavarnelle Val di Pesa Municipality territory, few step from the main square where there is the water well and the Historic Palace. The owner are friendly and they manage spontaneously. The best you can eat there are the hare Pappardelle and the stewed wild-boar . Than don't forghet they self made dessert that are always gorgeous. FOUR STAR. This Pizzeria "Il Fiano" is quite an historic pizzeria, one of the first and one of the best. This pizzeria is different from every other because their speciality is to cook (if you ask) the pizza on the peel instead to cook it on the owen floor. The result is a pizza little different and very, very good. As for places where you eat very well you have to book a week in advance to be able to find a place at a reasonable time, unless you are like me and go there to have (a second) dinner at 10 pm or 11pm. Some reported me to not have found that Pizzeria, in fact it appears from outside just like a house since they are so famous they do not need to put any kind of advertisement to be localized. The Pizza with strawberry or "Nutella" are the most appreciated dessert. My rating for their "pizza sulla pala" (peel pizza) is FIVE STAR. PIZZERIA IL FIANO DI ORSI LIDO & C.
You have to try the famous "Sienese PICI" choosing between different abbinations than to follow all they have as the plate of the day. In addition it is near the Piazza del Campo main square. No doubt: FIVE STAR. I eat there the wild boar with black chocolate was interesting. Vecchia Osteria Dei Poeti - Sorelle Sammuri S.R.L.